Bonjour à tous et à toutes ! Today’s blog will cover the topic of Food & Drink. There are so many delicious specialities offered by French cuisine, it’s hard to choose between them! However, I will focus on some delicacies of the Rhône-Alpes (the region where I am currently studying). In accordance with French stereotypes, cheese is very much appreciated here. I had never heard of ‘La Raclette’ before I came to Chambéry, so I was rather amused when the waitress placed about a third of a giant cheese wheel on our table, followed by two plates piled with charcuterie (continental meats such as salami, chorizo and parma ham), boiled potatoes and slices of baguette, to accompany the cheese once it melted. Needless to say, I definitely rolled home after that! 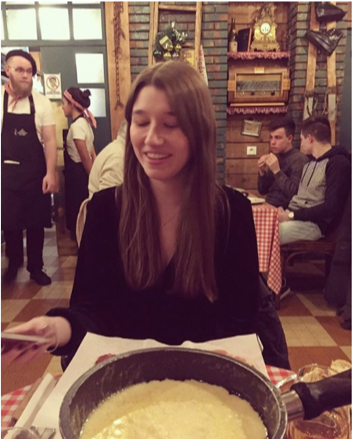 Un autre plat à la base de fromage est la fondue. En gros c’est une casserole remplie du fromage fondu, mélangé avec du vin blanc. 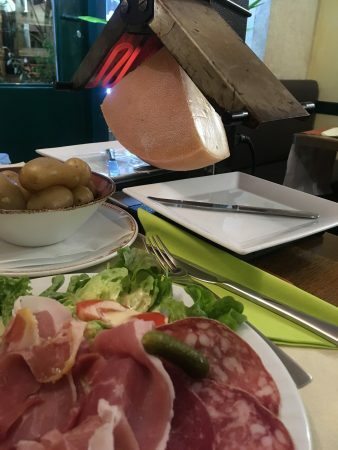 Habituellement, comme ‘La Raclette’, c’est servie avec la charcuterie et des tranches de baguette, que vous pouvez tremper dans la fondue. I’m sure most of you have eaten a crêpe before, and would agree that they are delicious! However, you may not have heard about a ‘Galette’. 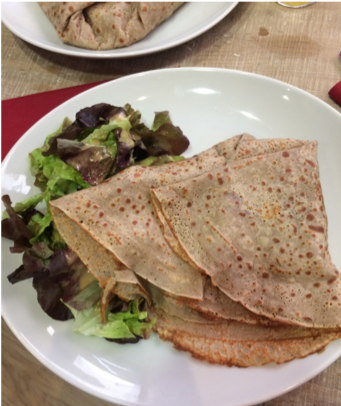 Galettes are the savoury version of a crêpe, made with bukwheat flour and filled with savoury ingredients such as ham and egg. 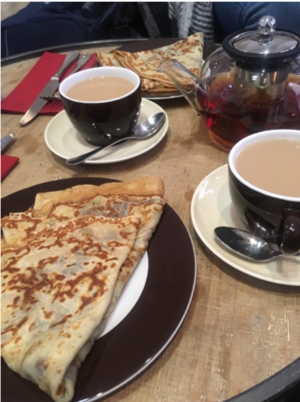 Locals tend to eat a galette as their main course, whereas crêpes are seen as a desert. The dish actually originates from Britanny (North-Western France), it is undoubtedly popular here in Savoie! Les Français ont leur propre interprétation sur les tacos mexicains. Dans l’Hexagone, les tacos ont fait d’une tortilla, remplie de la viande, des frites, du fromage et une sauce de votre choix. Je sens que c’est une nourriture d’amour-haine. Personnellement, je ne suis pas fan, cependant des autres délirent. As the department of Savoie was part of Italy until the nineteenth century, Italian cuisine remains hugely popular in Chambéry. Once again, the French have put their own twist on some traditional Italian recipes. Les garnitures propres à la région savoyarde incluent les pommes de terre, les lardons (morceaux de bacon) et le fromage raclette. Certains pizzas ont même une base du fromage au lieu des tomates. Much to my dissatisfaction however, my all time favourite toppings – ham and pineapple, appear to be socially unacceptable here! Although, maybe that’s a good thing! Due to the fact that there are a lot of vineyards close to Savoie and as many types of beer are brewed in France, there is a lot more variety in supermarkets than you would find in the UK. En particulière, les bières blondes et aromatisées (tels que la cerise) sont deux différences notables contre ce qui les gens boivent au Royaume-Uni. Quant au vin, il y a un grand choix dans les magasins, et grâce à la proximité des vignobles, le prix par rapport à la qualité d’un vin est meilleur qu’en Grande Bretagne. Ici, une bonne bouteille couterait environ la même qu’un vin de qualité bas chez nous, par example Echo Falls. The wine industry is something the French are especially proud of. I even had a two hour lecture about the produce, but much to our disappointment this did not include a tasting session! Another slightly French peculiarity, the best way of describing sirop is as a cross between squash and cordial from the UK. You mix sirop with water, as with the last two examples, however, the flavours tend to be more towards what we would classify as squash, such as mint and other fruity flavours. The liquid is also similar in strength and concentration to cordial, but if you’re looking for elderflower, best remember a bottle from home! This hasn’t really been to my taste, but many French people find it a refreshing drink in the Spring and Summer, and it’s a good way to stay hydrated. In short, there is a huge variety of food and drink for you to enjoy when in France! 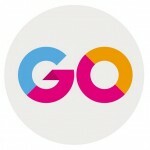 Thanks for reading this blog, I hope you enjoyed it! My next blog will be based on National Holidays and my local area of interest. If you have any questions, please don’t hesitate to ask!